Click here for more information on GP Extended Access. The Care Quality Commission (CQC) is the independent regulator of all health and social care services in England. 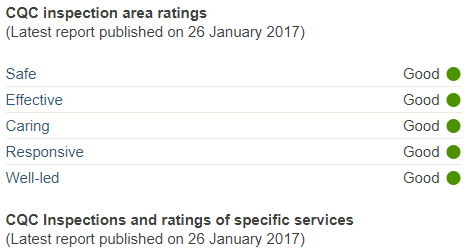 The CQC monitors, inspects and regulates hospitals, care homes, GP surgeries, dental practices and other care services to make sure they meet fundamental standards of quality and safety and publishes what it finds, including performance ratings to help people choose care. Archway Surgery is a small, friendly NHS surgery and accepts patients for all areas of Bovingdon. The team is dedicated to providing the best clinical care and administrative support for patients. We are an accredited Yellow Fever Vaccination Centre and are able to perform minor operations. We have both male and female GPs who are chosen for their approach to primary care and their caring attitude to patients. We aim to provide a first class standard of medical care in a friendly and professional manner. This website contains useful information about the services we can offer and how you can get the most out of a visit to the surgery. We are always happy to receive feedback and suggestions to help us improve our care even further. We are keen to set up a patient’s forum to help do so – this is a group that would meet occasionally to let us hear your opinions about our services. If you are interested in finding out more about this please contact our practice manager. Anyone making healthcare decisions needs access to high quality information: doctors need it to inform their clinical decision making; patients need it when deciding which treatment is best for them; and commissioners need it when making decisions about which services are right for their populations. Care.data is a new service being developed by NHS England which aims to achieve this ambition by providing timely, accurate information to citizens, clinicians and commissioners about the treatments and care provided by the health service.